With the Super Bowl coming up tomorrow, many of us are busy rooting for our favorite team. Football is one of the most followed sports in the United States, and consequently it gets a great amount of coverage. However, something that I, and many others, have noticed is the injustice in it—the normalized injustice that is allowing Washington’s team to be called the Redskins. For many decades, American Indian activists have requested that the team name of the Washington Redskins be changed. It is a fact that throughout history, the term redskin has been used as a racial slur against Native Americans. The name and even the logo in itself is offensive. It is not socially acceptable to call someone with Native American roots a Redskin to their face or even on the Internet, so why is it okay with the name of a football team? Since football is a recognized official league, having an injustice like this slip through the cracks gives the idea that such names are okay. Native American societal issues tend to be overlooked over along with Asian American issues, overshadowed by black and Hispanic issues. One could argue that blacks and Hispanics face more prominent obstacles and racism in society, but that should not have to mean that we ignore those facing smaller racial issues as a whole. Perhaps we have gotten so used to hearing the team name Redskins on TV that we have become numb to the desensitivity of it all. The logo of the Washington Redskins is also another issue in itself. It is what one would call your stereotypical looking “Indian,” with prominent reddish skin, braids, and feathers. The smaller issue is that the majority of Native Americans today do not look the same as they did the time the Pilgrims first sailed over, and such mascots lend themselves to further perpetuate harmful racial stereotypes. The bigger issue however, is that our society has made it acceptable to reduce an entire race filled with rich history, culture, and tradition, into an insensitive mascot. 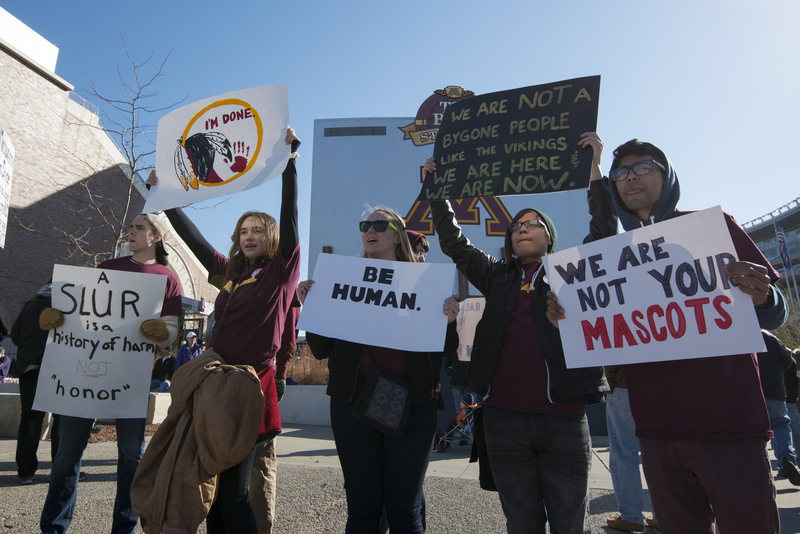 Since the Washington Redskins have been around for a long time, however, it is not a surprise that many have not even noticed the problematic issues the name and logo present. In other words, it would be the same as if we had a team called the “Pittsburgh Negroes” or the “Kansas City Jews” or “San Diego Caucasians.” So why is it that the name Washington Redskins doesn’t seem to raise a red flag? It is not just in football however. In baseball, the Cleveland Indians have also been the source of much controversy. The logo of the Indians is in some ways even more blatantly offensive than the Redskins’. Their logo is of a firetruck red “Indian,” smiling widely, having overall devilish-looking features, with one feather behind his head. Looking beyond sports, Native Americans have been inaccurately portrayed through multitudes of different media. In the classic kid movie Peter Pan, the scene with “Indian Chief” and “Princess Tiger Lily” did not go by completely unnoticed. Having unnaturally red skin that no human actually possesses, the typical face paint and feathers, along with the inhumane demonic voices and behaviors made many question simply: why? Some argue that these sports teams and movies will and should not change, simply because they are part of a tradition. It should not be tradition to be racist, however, and this is something that a society should never be proud of.